Wheels of Hope transport driver Debbie Fierro delivers Thunderbolt, a Shiba Inu surrendered to ACC, to a NYC Shiba Rescue foster home. 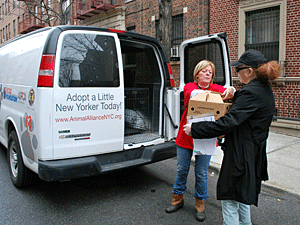 Every day of the year, the Mayor's Alliance for NYC's Animals' fleet of six Wheels of Hope vans is on the road, transporting pets who are at risk of being euthanized from the city's Animal Care Centers of NYC (ACC) facilities to rescue groups and no-kill shelters with the resources to find them new homes. Since 2005, when the program began, we have carried more than 93,000 animals on Wheels of Hope on their first steps to new lives and families. In 2015 alone, more than 13,200 animals were transported via these "sanctuaries on wheels" to foster caretakers, rescues, and no-kill shelters that placed them in forever homes. Animals are at risk of euthanasia 365 days of the year, so this program is up and rolling 365 days a year. How Does Wheels of Hope Support Our Goals? Wheels of Hope is the only free animal transportation program in NYC (where most people rely on public transportation), and the only program with the ability to transport dozens of animals at the same time. The free Wheels of Hope transportation service to no-kill shelters and rescue groups means these organizations can save more animals and focus their energy and money on finding homes for the ones they save. Wheels of Hope transport driver Debbie Fierro delivers Jenny, a cat surrendered to ACC, to an Anjellicle Cats Rescue foster caretaker. Wheels of Hope allows ACC to move animals out of their facilities more quickly, creating space for additional animals arriving at their shelters and reducing the chances that these pets will become ill. This lessens the suffering of the animals and reduces medical costs to the no-kill shelters and rescue groups that save them. Wheels of Hope supplements the resources of the Alliance's 150 partner rescue organizations and shelters, allowing them to focus on what they do best: finding caring, permanent homes for the animals. All costs of the transport program, including the vehicles themselves, maintenance, fuel, insurance, licensing, the salaries of our dedicated drivers and transport coordinators, are borne by the Alliance, a 501(c)(3) non-profit charity that does not receive any government funding.